Ohai, Anni! Wair iz ebreebuddeez? And why is this not a “caption me, plz”? But anyway, congz on your solo! and only comment for 13 minutes! Thx Q! Sumtiemz happins at dis tiem uv dai. An Ai spoze dere wuz lossa belleh LOLs wiv capshuns awlreddee. An’ ai haz kno ideer hao Prysma and Seanya keep this beeg fing rolling along. Dey is wizzerds, aifinxo. Ai do liek tuxedo kittehs, ai muss say so. And dis wun luuks liek the wite part is abaot to overwhelm the black part. Teh famblee kitteh wen Ai wuz berree yung wuz a tuxie, soe Ai hab a sawft spot fur dem 2. Wud be nuffing tu keep rolling wifowt peeps talking an peeps sending me stuffs to post. I just traffic director an I yell fur seanya when teh hevvy techie stuff comes up! That nawt taked long! 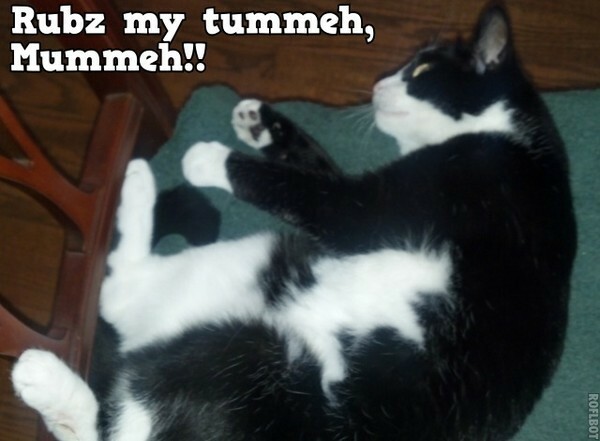 *sigh* Mebbe was nawt best plan furra theme – evreewun overloaded on teh bellies an hazza com-toes! Sumtimes fur teh theme days, if ai hazza lotsa awsum capshuned wuns I skip teh caption-me. But was wun at midnite an will be nuvver wun at neggst midnite! I hadda take da bandij off Lady Jane’s leg dis mornin (a gift frum Sir Jury yessterrdae) an hadda puts on da kone ub shame – cuz she startid ta likliklik da stichiz… She hadda leetol fit an twies to wipe it offa her hed, but I toldid herz to stop an made herz lay unner da tabol bai mee. Lookee — I haz witchy hat too! Iz it juss me, or duz it luuk like tehre’s a liddle wite kitteh sleeping on dis kitteh’s belleh? OMCC your rite! tis a speshul birthmark! Hay, 2kittehhouse! Hao duz Tuxedo feel abowt admiring worshippers? Well, since you say it that way…..
Lunarmommy – could I borrow you “hazfloof soot” pleeze? I has enuff fur teh TV-an-Movies, Hunting Skillz, an Famblee (o, a muchness fur famblee!) theme days… but nawt enuff fur Hallowe’en! And I only just decided about making Nov 1st a black cat apreeshiation day wif no basement refrinses at all, since is moar tu black kittehs tehn teh Basemint, so I nawt counted yet, but I betcha I can use sum pics wif black kittehs. Sumfing tu consider….